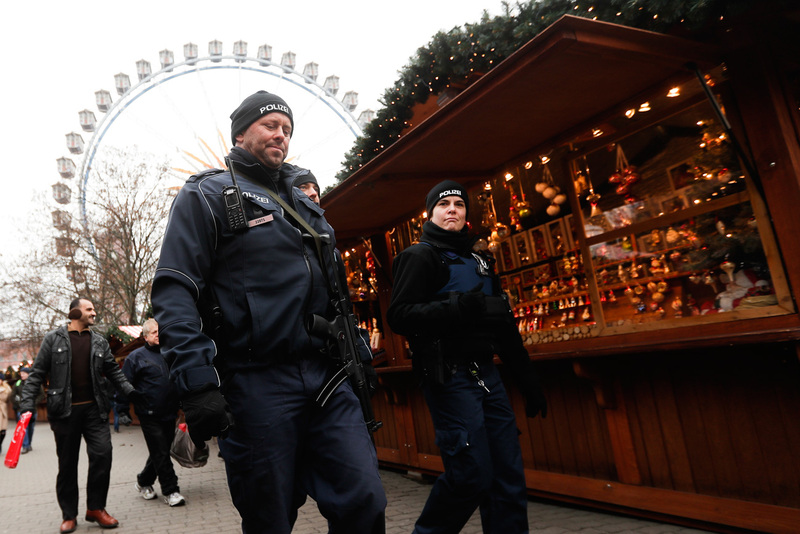 Police officers patrol over a Christmas market near the city hall in Berlin on Dec. 21, 2016, two days after a truck ran into the crowded Christmas market at the Breitscheidplatz in the city and killed several people. The dramatic murder of Russian Ambassador to Turkey Andrei Karlov and the truck bulldozing through a Christmas bazaar in central Berlin that killed 12 people and injured 48 happened within the space of several hours. Both signal that terrorism will be the “new abnormality” of the coming year, and Europe needs to adopt a new strategy. It has been reported that Jaish Al-Fatah (part of a coalition of radical Islamic groups that includes the organization formerly known as al-Nusra Front) has claimed responsibility for the Dec. 19 murder of Russia’s ambassador to Turkey, Andrei Karlov. However, the group has since denied that it is to blame for the killing. Why didn’t Russia’s slain ambassador have Russian bodyguards? If these claims turn out to be true, and the attacks were carried out by Islamist radicals pursuing a jihadi war against the apostates, the Shia believers, and the Western heirs of the Crusaders, then U.S. political scientist Samuel Huntington’s prediction of the coming “clash of civilizations” is already close to becoming a self-fulfilling prophecy. In this unorthodox hybrid war – which radical groups claim is also being fought by means of unchecked flows of illegal migrants from Muslim countries – Germany and Russia are confronting one and the same foe. Unfortunately, to the detriment of the seemingly common fight against “international terrorism” so often mentioned in solemn declarations, Europe has so far refrained from joining ranks with Russia to eliminate this deadly threat. In Moscow, there is a feeble hope that things might now change. The apparent double strike by Islamic militants with fundamentalist roots may finally convince political elites in Europe that the old continent has reached a bifurcation point. This fork in the road is a formidable challenge. The two paths that Europe has to choose from are poles apart. One is a policy of benign neglect towards the failed and rogue states in the Middle East and North Africa, which will undoubtedly spew out more Islamist fighters and floods of refugees seeking asylum in the European Union. It entails also a naïve belief in the miraculous absorption of a million-plus immigrants who so far have shown a lack of interest in accepting the standard rules of co-existence in multi-ethnic societies. The other option for Europe is to deal directly with the root causes of the regional disorder. This is linked, like it or not, to the rise of Islamist fundamentalism, to the disenchantment of millions of young Arabs, Afghans, Libyans and others with the inability of the ruling strata to ensure decent standards of living. It is also linked to the impotence of local regimes to embrace modernity other than in the form of iPhones. If Europe, and Germany in particular, sticks to its present laissez-faire tactics, the newcomers, rigid in their religious regulations and domestic habits, will undermine social cohesion. It was reported recently on the Runet (the popular collective abbreviation for Russian internet domains) that a teenage Russian girl who planned to go on vacation to Germany during the Christmas period was persuaded by her parents to choose a destination in China for the sake of her personal security. For Europe, going along the second path would mean accepting the realities on the ground. In particular, it would demand from the political leaders of Europe that they accommodate the idea of preserving, at least for a while, the secular regime of President Bashar al-Assad in Syria. The alternative would be most likely the brutal medieval rule of those who dream of a Caliphate. Sticking its head in the sand won’t help Europe. A pro-active EU foreign policy in the troubled region would essentially require cooperation with major regional powers, not only with the Sunni united front, that is the Gulf monarchies, but also with Turkey and Iran. Such a ”pivot” to the Middle East for the sake of “positive engagement” would also demand that Europe take into account the essentially coordinating role of Russian diplomacy, backed by Moscow’s military task force deployed in Syria and the Eastern Mediterranean. Recently, German top executives from the ruling party joined the chorus of critics alleging that Moscow either has or is intending to hack the general elections due in September 2017. Apart from generating an obvious suspicion that it is a preventive measure aiming at challenging and possibly undoing the mistakes made by the embattled Angela Merkel, this appears to be a “red herring” aimed at distracting the public from the real dangers facing the country. Would it not be wiser to admit that it is not the unnamed, undetected but suspected Russian hackers that are “meddling in domestic politics” in Germany but the Islamist militants? Isn’t there enough proof that the religious fanatics who have infiltrated Europe, as they claim, with the flow of migrants, pose a grave danger to peace, stability, and the future of this nation in the heart of Europe? Let’s be fair: Such an admission would require from Berlin, and not only Berlin, a courageous reassessment and abandonment of its previous stake on confrontation instead of dialogue with Moscow. However, the chain of recent terrorist attacks by Jabhat Fatah al-Sham, ISIS and their followers – beginning with the November 2015 Paris attacks, which left 130 dead – seems to send an unambiguous message: It’s time to “know your enemy” – and to know your friend.